He’s not your typical Casanova, one who’d sweep you off your feet at your first meeting. Don Carlo Matugas is one of Cebu’s most eligible bachelors. And what makes him even more attractive is the fact that he is God-fearing and a Marian devotee. 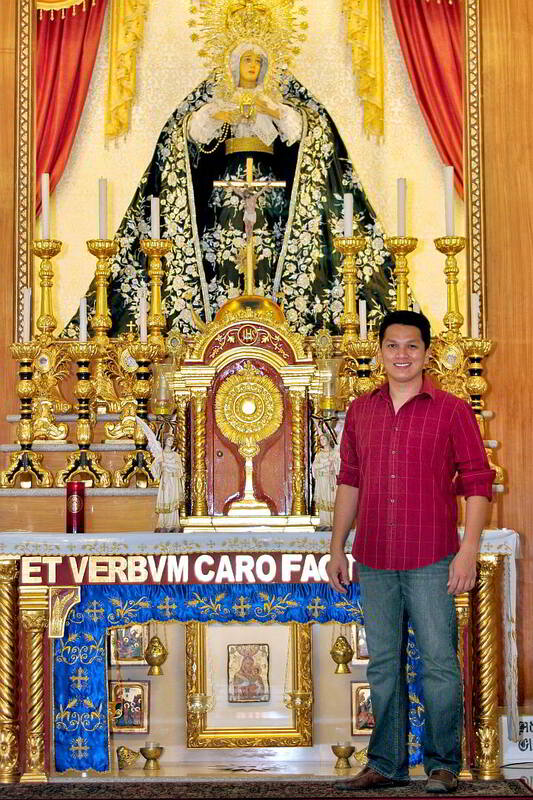 This Nursing graduate from Southwestern University is pretty much active in church activities, especially as far as keeping sacred traditions, like the carroza during Holy Week in Danao City where his family is from. He is also a member of the Hermandad de Santa Rita de Cascia, a cofradia of followers of the Saint of the Impossible. During the canonization of Pedro Calungsod, he was there praying with the faithful in Rome. Truth be told, he is entertaining the idea of entering priesthood —unless someone wants to change that. For this pre-Valentine’s Day issue, the Play! pool paid Carlo a visit at the Matugas home (where he maintains a private oratorium of Our Lady of Sorrows blessed by Cebu Archbishop Jose Palma). He was in the middle of baking, tending his dogs, and playing big brother to children who he has taught the rosary, among others. Talk about a good catch! What are the qualities you look for in a special someone? Someone very family-orientated. Someone who will get along with every one in my family, since I am very close to them. Someone who can consider them as her own. Also, someone faithful. I also prefer someone who is close to her mother because as I have noticed, ladies who are close to their moms are the ones who are most loving, caring and thoughtful. What is a deal-breaker for you in a relationship? When someone is unkind, disrespectful and selfish. And, of course, if there’s a third party involved. Once you break that trust… it can never be undone… and you’ll have a hard time trusting that person again. It would lead to a lot of quarrels and eventually, a breakup. Describe your first encounter with Cupid. My first encounter with Cupid was when I was in fifth grade. I fell in love with my seatmate, gave her pencils, paper, and bought her chocolates or ice candy. Hahaha! I was even called to appear at the guidance office for embracing that girl and kissing her on her cheek without her permission. She cried hard because she thought she would become pregnant. Hahaha! Nagkauyab gyud mi after high school but it didn’t work out because ours was a long distance relationship. US-based naman gud ko ato. Why do you think most relationships fail? present in order to have a good relationship. Seriously, I don’t subscribe to the idea of a soulmate. Well, what if each one had only one soul mate, a random person somewhere in the world? Hahaha! What a nightmare that would be. I believe in love, when an individual falls in love, regardless of the other person’s color, iyang kagikan, iyang batasan, iyang family. Have you received indecent proposals? A big yes! Many times. Name all indecent proposals and I’ve had it. What is your stand on ladies courting guys? I’ve experienced that many times and I don’t see anything wrong with it. I have so much respect for that kind of expression because mostly mga laki man gyud mohimo ana. I think it’s nice when you experience that once in a while. But I’d like to do it the old-fashioned way… be the one to court a lady, to prove that I am a gentleman. If you are going to take someone on a first date, where would you go? Describe your ideal romantic date. First thing, I would take her to church and tell her that this is heaven on earth for me. I would take her to one of our properties where we can view the beautiful sky and the sea. No distractions, just the smell of fresh air and the sound of birds. We will have a picnic, share stories with each other. After that, I will take her home to her parents with a promise that we will see each other again. Do guys experience kilig moments, too? What makes you kilig? Ma-kilig ko basta na’ay gwapa and especially maka angay ko. What is your courtship style? I will first ask her if she is going out with someone. I will let her know that my eyes are on her Facebook all the time. I will send her text messages and flowers and also tell her that I like her. And if everything goes well, then that would be the time to ask her, “Pwede manguyab?” If motubag siya og “I love you, too” then uyab na mi but if dili … patay! Given the chance to make an impression on someone, how would you put your best foot forward? I would cook tenderloin steak, medium-rare, with white sauce and baked apple with sweet syrup. It will be my way of showing her that she will be taken care of. Would you go for a blind date? Oh, yes! A blind date is exciting. I’d love to have that… but I just can’t guarantee if it’ll work out well. You love dogs. Must your partner love dogs, too? She doesn’t need to love dogs particularly, but I would prefer someone who is an animal lover para magkasabot mi sa ana nga aspect. Would you be willing to convert to another religion in favor of true love? I am a Roman Catholic and just like any other member of this Church, I also have doubts and questions but these have been answered through research and studies with Church authorities. So I guess I will convince her to fear and love God through the sacraments of His Church. But if we decide to stay together we must face the consequences of having different religious beliefs. But I will do my very best to “convert” her. How do you keep the flame in a relationship burning? I make sure they feel loved and important by staying sweet and affectionate. I want to look at it as how I would want my mother and sister to be treated by their men. If I have a lover, I will make sure that that person is the only one. I will treat them as how they should be treated; with respect and most especially with love. That’s what my parents taught me in handling relationships. How would you spend Valentine’s Day? Well, since I’m pretty much single, I think I will go to church, hear Mass and ask St. Valentine for a partner. I’ll have dinner with some closest friends and go to bed… to sleep. (laughs) I hope I could knock on someone’s heart just before St. Valentine’s Day.